These pieces are nearly all rare, usually worn, and illustrations are hard to find – so, similar to my other Irish token guides, this is a “work in progress” and additional images will be added as and when I find them. They differ from the previous 17th C Tradesmens’ Farthings series insofar are they are larger, of better weight and are mostly copper – with a few silver. The fact that most examples are well worn suggests they were circulated over over a long period of time. The fact that several die types exist for several tokens suggests they were a popular medium of exchange (currency) since they were re-issued several times over the lifetime of the series, i.e. more tokens were needed than originally anticipated. The fact they are all comparatively rare suggests that most of them were all redeemed, i.e. the underwriter (or promissary) was honest in his dealings and was solvent. This contrasts sharply with the experience of the ‘fractional’ promissory note holders of the late 18th and early 19th centuries where sudden bank failures meant that most of the note holders never received their money. Once a few tokens had appeared and were ‘exchanged’ successfully, they may have seemed a tempting speculation for other men who had little direct connection with relevant trades. Equally, some temporary shortage may have prompted the first issues and the later tokens may then have been the continuation of a convenience. The promissory formula mimic that on later 18th C banknotes which may be significant, since the banks were of an undeveloped stage in Ireland outside Dublin – although this idea is contradictory to the existence of the tokens of John Maculla of Dublin. Belfast did not get its first bank until some years later, and it then went out of business in a very short time, not to be replaced for a further period. Merchants, many involved in the linen trade, facilitated trade between themselves at this time by the use of promissory noses. At the end of the eighteenth century, it seemed that every corner-grocer or bar-owner, particularly in the west of Ireland, was issuing pseudo-banknotes or printed IOU’s, mainly as an easy way of maximising cashflow and transactional profits, which may be seen as paper equivalents of the tokens. The more substantial issuers of Ulster may also have seen an opportunity to avail themselves of cheap money at the earlier date. The fact that Alexander Beith (Ballymena), John Stewart (Killyleigh) and John Galloway (Portaferry) had to warn against counterfeiters would also suggest that that these tokens were very acceptable to the people + were of significant economic value, i.e. counterfeiters do not fake coins that are worthless. Thus, the introduction of the new regal halfpennies in 1736 and the regal farthings in 1637 seems to have prevented the further spread of these 2d and 3d tokens. Unlike the experience of the 17th C, the authorities seemed to have acted much more quickly to the usage of unofficial tradesmens’ tokens. Of course, times were different – the early 18th C was a period of relative peace, unlike the catastrophic religious, political and military upheavals on both sides of the Irish Sea during the previous century. Thus far. Dublin is the only county outside of Ulster where traders have been recorded to have issued these tokens but, significantly, it was the first place to have issued tokens like this – so I am beginning this guide with Dublin. 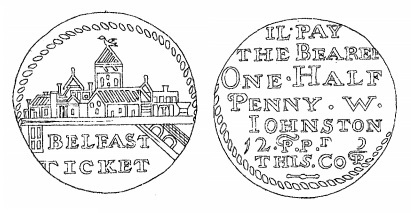 The earliest issues were halfpenny tokens, starting in 1724, by James Maculla – a pewterer and coppersmith in Dublin who was also a pamphleteer. He attacked Woods’ coinage of 1722-24, albeit openly whereas Swift went under the nom de plume Monsieur Drapier in order to avoid prosecution should he go too far with his criticism of the government of the day. Maculla went on to propose the supply of a token coinage of his own in a plan which he publicly stated. To circulate copper tokens for pennies and halfpennies stamped with a ‘promissory message’ to pay twenty pence for every pound of copper notes whenever they should be returned. There was to be forty-eight halfpence to the pound, avoirdupois, which he undertook to sell at two shillings. This be calculated would allow little more than 16% profit, provided the tokens were returned without loss of metal by circulation, and provided the expense of stamping should amount to sixpence each pound. 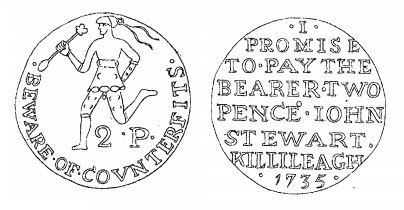 Maculla submitted this plan to Dean Swift, who disapproved it as but little security would be given to the public “that the tokens should always be made of the intrinsic value which was proposed in the project.” This is the same Dean Swift that led a campaign to stop the circulation of William Woods’ light-weight coins from 1722-24, and Swift predictably dismissed Maculla’s plan – his tokens were even lighter than Woods’ tokens. Swift proposed a counter plan; to form a society of ten gentlemen to issue tokens of increased specific gravity to Maculla’s tokens. This project was not taken up and Maculla duly issued his tokens, notwithstanding the criticism to which the plan had been subjected by Swift. There must have been a need for them because these too are quite scarce and any that are found, tend to be well worn from circulation. The lack of much further comment from Swift suggests he was not much affected by them. A Letter on Mr. M‘Culla’s Project about Halfpence was written in 1729 but not published until 1759 – The works of Dr. Jonathan Swift, Dean of St. Patrick’s, Dublin. Volume VIII. Part I. Collected and revised by Deane Swift, Esq; of Goodrich, in Herefordshire, Vol. VIII.i, pp 148-60. Does this mean that the above coin of 1724 has a blundered date? Dr Aquilla Smith thought that this piece was intended to pass as a shilling. This opinion is inconsistent with the idea of the period. The issuer probably intended to convey that he was prepared to pay, on return of the tokens, either in regal silver (shillings). The existence of the Dublin token issued by Ben Bowen rather disturbs the pattern presented by the other coins. It is undated, but it may be assumed, at least on stylistic grounds, that it appeared at a similar time to the rest of the Ulster series. This might be a mere coincidence since, worryingly, Simon fails to make specific mention of it. It may be the link between Maculla’s experiment and the Ulster series but, equally valid, is the suggestion that it is unrelated to either. The known specimens of Bowen’s tokens are in much better condition than the Ulster equivalents – suggesting that a more limited circulation. The legend specifies that Bowen owes 3d sterling. 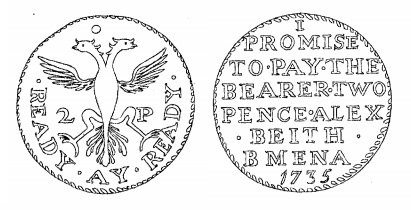 This complication has some interest in that it may indicate an access to regal specie – which was in short supply in both England and Ireland at the time of Maculla’s tokens and the Ulster tokens. The 3d denomination is similar to the 3d tokens of Ulster but the silver is not. After almost 300 years, the jury is still ‘out’ on this one. That Maculla’s tokens pre-date the Ulster tokens is a fact – whether or not they were the pioneering project that launched the Ulster tokens is a very different matter. Firstly, Maculla’s tokens are halfpenny and penny tokens, whereas the Ulster series are mostly 2d and 3d tokens. It could be argued that Maculla proved his concept and that the Ulster issuers improvised further. Of the Ulster issuers, only Edward Smyth was what Dean Swift would consider a ‘gentleman of substance’ with the necessary wealth to underwrite his scheme. The concept and the size of the tokens are broadly similar insofar as they are all promissory tokens – forerunners of the promissory notes the banks would begin to issue soon after. As such, these tokens are an important part of our numismatic heritage – worthy of collecting and further study. Linen (and other agricultural produce) was bought for cash at the markets, in the case of linen passed on for bleaching, then much of it exported, first through Dublin, but increasingly through northern outlets, predominently Belfast, with payment being made in bills drawn on London. These were then cashed and the currency entered the system again, often to buy yarn and pay rents. The Ulster series of tokens may have been an interim experiment in breaking the monopoly of the Dublin bankers, their restrictive policies and the development of private banks in Ulster. Similar to the format of the 17th C Tradesmens’ Tokens, from this point forward, the guide is set out by County, then by town, and, finally, by issuer. Unlike the tradesmens’ tokens of the previous century, it is highly unlikely that these tokens were produced by retailers for the purpose of handing out change for retail transactions. Reflecting upon the topic of geographical distribution, it should be noted that the greatest concentration of issuers was along the Lagan Valley. This was the centre of the linen industry and a spine of prosperity in the Ulster countryside. The prevalence of the linen in this area used to be attributed almost entirely to the presence of numbers of Huguenot settlers, but this opinion has been partially corrected by other evidence. This is a common surname in the Ballymena area, but no trace has been found of a James of even approximately the right date there. There is, however, plenty of information about James Adair in Belfast, who was leasing property extensively in the late 1740s, sometimes in association with substantial players in the commercial life of the town. James Adair appears in a list of linen drapers in a 1758 Belfast News Letter.52 If this is our man, then he was also a partner in the first Belfast Bank, founded with two other prominent Belfast merchants in 1751. The bank was wound up, solvent, in 1757, perhaps because of legislation passed by the Dublin parliament which forbade an individual to act as both banker and merchant. Johnston’s coin, represented by only two surviving specimens, declares itself to be a halfpenny, but the Ulster Museum specimen appears to be countermarked with a 13, which may indicate revaluation to a penny – or one thirteenth of an English (or Scottish) shilling. This would seem to be a half-way stage between Maculla’s coins, valued by weight, and a fully token coinage, as represented by the rest of the Ulster series. Lionel Fletcher published his specimen of the Johnston token in the second series of the Ulster Journal (1903,14) providing a much better illustration and a clearer interpretation of the legends. He suggested two possible issuers of the right name, ‘Pipewater Johnston of Newforge’ and a baker, admitted free of the town of 1729. Robert Heslip proposes the former as the more likely of the two to have issued this coin – the William Johnston here favoured as token issuer seems to have been a man of quite considerable wealth. In 1731, he was involved in a complicated series of transactions with Arthur Hill over the townlands of Ballylesson, Edenderry and Breda, plus fisheries on the Lagan. There were disputes and a total of £3,275 seems to have changed hands. The soubriquet ‘Pipewater’ was derived from the grant of a lease by the trustees of the Donegall family of ‘all waters, rivers, brooks, wells and water streams adjacent and contiguous to the town of Belfast’ at a nominal rent of 20s per year for 41 years. The laying of pipes and associated works will have been a heavy expense and presumably Johnston was speculating against revenue from water charges. John Knox is known to have ‘signed watches’ and this would have made him a goldsmith. Since goldsmiths claimed a monopoly monopoly in dealing in precious metals, Knox (like Ringland) would have been a man of means when compared to traders such as bakers, drapers and general merchants about the town. 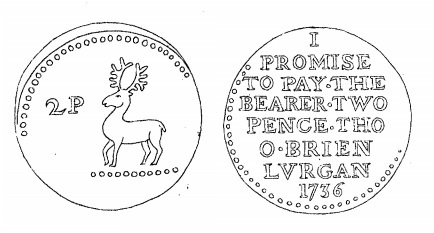 William Ringland was responsible for the most tokens in this Ulster series. Pennies and twopences dated 1734 and a twopence of 1735 are attributed to him – and several minor ‘die variations’ exist for each. Ringland’s coins remain relatively more common than the rest of the Ulster series. Unfortunately, comparatively little is known about Ringland, but it is known that he was admitted to the Dublin Goldsmiths Company and signed watches of about 1740. Members of the goldsmith’s company claimed a monopoly in dealing in precious metals, so Ringland would have also been ‘a man of means’. Reverse: * I * PROMISE TO PAY . Ye BEARER ON DEMAND TWO PENCE PATRICK BROWN . BREBY . Hugh Montgomery of the Ardes was the first Earl of Mount Alexander in the 17th C, and the name Hugh occurs in Burke’s Peerage. The HUGH MONTGOMERY on this token appears to have been born c. 1689 in Glenarm, Antrim, Ireland, and died 1767 in Londonderry, New Hampshire, Rockingham County. He married JEAN CARGILL May 22, 1715 in Ballymena, Antrim, Ireland, daughter of DAVID CARGILL and JANET SMITH. She was born c. 1685 in Ireland, and died 1772 in Londonderry, New Hampshire, Rockingham County. Edward Smyth was born either in 1700 or c. 1693, with the latter being the more likely, and was the grandson of a Colonel Ralph Smyth who was killed at the Battle of the Boyne. He was educated in Lisburn by a Mr. Clarke and graduated from Trinity College, Dublin, in 1721 with a degree in law. He is described as `Counsellor at Law’ in 1743 and became an honorary DLS from Trinity in 1747, at a cost of £ 1 17s. 6d. As is usual, information in P.R.O.N.I, relates largely to real property and even at that, must give only a partial picture. He was twice High Sheriff of Antrim, in 1747 and 1756. From our limited knowledge of his parliamentary activities and references in the Belfast News-Letter, it can be seen that he tended to support the anti-government side in the Surplus Revenue Dispute, which rumbled on in the middle years of the century. He stood in the Carrickfergus election of 1768, but he was not elected. He was appointed Commissioner for the Milita in 1756, for both Antrim and Down (which was unusual) together with, amongst others, members of the Hill, Waring, and Rawdon families. He was also Registar for Schools for the dioceses of Down and Connor. These posts all imply a man of substance, busy with official affairs as well as private. Such activities signify a certain level of prosperity, but more direct indications may be found from other sources. Working backwards, according to Robert Heslip, “it is fortunate that his will survives in the Registry of Deeds in Dublin and has been published in abstract. In the absence of estate maps or other precise information, one cannot be accurate as to the exact amount of property involved, but even a brief list is sufficient to show a man of considerable means, at least at this stage of his life. He left `real and personal estate in Co. Down, consisting of the townlands of Dromarebregue, Ballykeale … and Aghnaskeagh’, in Antrim the ‘half townland of Caruaghlig … and the half townland of Ballyhill, otherwise Ballykill’, `two leases in the townland of Anakogh’, a parcel of land in Ardglass, `…about five acres, with three small castles standing thereon’, `freeholds in the town of Lisburn’, `my old mansion in Derryaghy’ and a legacy of £ 1000, as well as various smaller bequests. Having no son, the main beneficiaries of the will were three nephews, Roger, Matthew and Philip Johnston, who were asked to take the name of Smyth. One may presume that adequate settlement had already been made on his daughter Anne, who married a James Carroll, farmer of Aghagallon, in 1765, in which year her marriage portion was £ 100 per annum. This prosperity was not confined to Smyth’s declining years. The earliest transaction for which information survives is a lease of 1736. There are a series of three leases around Market Square in 1743, resulting from the break-up of some of the Conway estate, the rents for which are comparatively small, but which must have represented, if not immediately, then later, prime property. He had other holdings in Bow Lane, Castle Street and Magee’s Tenements. More impressive is his involvement with Mark Ker O’Neill in the leasing, for twenty-one years, of 1500 plantation acres from Clotworthy O’Neill, the total rent payable being £ 163 7s. 5d. It is safe to say, therefore, that Smyth was a man of means at least by the 1740s, although the scale is more difficult to estimate. Knowledge of his father’s affairs might have provided more positive evidence, but unfortunately neither this, nor his wife’s settlement, seem to have survived. Heslip goes on to add “To sum up, Smyth was a man of substance, M. P. and holder of legal office, for whom no evidence of actual trade survives. If not considered quite gentry, he was not far from the dignity and mixed, professionally and socially, with the upper classes. He started life with a good education, or one which at least fitted him for a lucrative profession, and probably a fair patrimony which he enhanced quite rapidly, reaching a considerable prosperity in his middle years, dying wealthy with few debts, able to provide for his family circle. If he was not trying to facilitate personal trade by his issue of tokens, what was his aim? A quick glance at the sources available for the other men who issued tokens seems to show that we can learn more about Edward Smyth than any other. There is a significant over-lap between the token issuers and men known to have signed clocks and watches. The horological connection does not suggest any technical skill, rather the availability of risk-capital and this is a line of enquiry which might produce rewards at a later date. They might have also been pawnbrokers. Robert Heslip is Assistant Keeper in the Department of Local History in the Ulster Museum, with special responsibility for the numismatic collections. James Greer of Lurgan on his piece shows a roll of linen and describes himself as draper. Smyth appears in a short list of men who approved an advertisement by the linen drapers of Lisburn, extolling the benefits of fair trading. It is possible that the tokens facilitated the payment of out-workers and they may have represented a convenient sum in terms of piece-work. It is stated in Knox’s History of the County Down that this family descended from Henry Greer, who came to Ireland from Dumfriesshire and settled in Lurgan in 1653. The family is now represented by Captain J. W. Greer, The Wilderness. Joseph Wilson issued tokens in Lurgan, but later seems to have moved to Dungannon where, in his declining years, he claimed acquaintance with John Foster, later Lord Oriel and Chancellor of the Irish exchequer. Amongst the Foster papers is a printed document, unfortunately undated, which offers to communicate a new, better and (naturally) cheaper, method of bleaching. The possessor of the secret boasts that he has had three years experience ‘in a large concern’ which used it ‘in a very extensive manner’. Communication may be made with the inventor via Mr. Joseph Wilson, ‘who is fully informed respecting the method’. It would seem a reasonable deduction that Mr. Wilson was the proprietor of the extensive bleaching green referred to. Reverse: I . PROMIS . TO . PAY . THE . BEARER . THREE .. PENCE . Samuel Mackie was a clockmaker in Richhill, Co Armagh and, possibly, a member of the Goldsmith Guild. Francis McMinn does not name a place, which may have significance in either indicating a certain prominence, or that his coins were only intended to circulate in a very local area. We now know him to have been based in Donaghadee, as that time a busy port for the short sea crossing to Portpatrick, used extensively for the northern mails. Typically, the information available now does not suggest he was a shop-keeper, but that he engaged in the sort of mercantile activity expected of a trader based in a small, active ‘linen’ port. There may be a family link to a Mr Edmund Hall, who issued a tradesman’s token at Dromore, c. 1663. “In the year 1685, James II incorporated by charter the Governor and Freemen of the Corporation of Horse Breeders in the County of Down.” In the Gilford Directory, the Rev. John Cochrane, Presbyterian Minister, occurs, and the family, since this token was issued, has been an important one in this town.” Dr Aquilla Smith. The tokens of Thomas Fisher of Newtownards are perhaps the commonest of the whole series, probably as the result of a nineteenth century hoard. There are several varieties, some of which used a number of dies. Galloway followed the example of Alexander Beith of Ballymena, and gave notice : “Tickets Local-Whereas some Persons with a Dye and Press have counterfeited the Tickets put out by John Gallway (sic) of Portaferry, Merchant, and sell them to severals at half what they pass for. Now I do give this public notice to all Persons who have any of my Tickets; that they may bring them unto me at any time before the first of May next (Counterfeits excepted) and I will pay them in Gold or Silver, and will give two Guineas Reward to any Person or Persons who will discover the Person or Persons that made these Counterfeit Tickets with the Dye and Press, so as they may be convicted of the said Cheat. John Gallway.” Belfast News Letter, from March 13th to April 27th, 1839. This token is not mentioned by Davis, Seaby, or Heslip. A unique specimen was offered for sale by Glendinings in 1989. John [—] h, 2d. 1741. Reverse: I PROMISE TO PAY THE BEARER TWO PENCE The remainder of legend detrited. Another place that issued tokens around this time, albeit slightly later, was Ballycastle. Aquilla Smith included them in his listings but there is considerable debate as to whether or not these tokens are actually part of this series. This token, which is of good workmanship, and made of pewter, was probably issued by Mr. Boyd, shortly after the year 1736, for the convenience of the poor at Ballycastle. Hi I have a coin that I have not seen on the net before. I have been looking to find out something about it and it seems like you may be my last hope .thanking you Eugene.